Learn how to make Anna Craig’s gumpaste ranunculus, as seen on her multi-dimensional sugarwork cake on the cover of Volume 4, Issue 7 of Cake Central Magazine. 1. Bend a small hook in your wires using the needle nose pliers. 2. 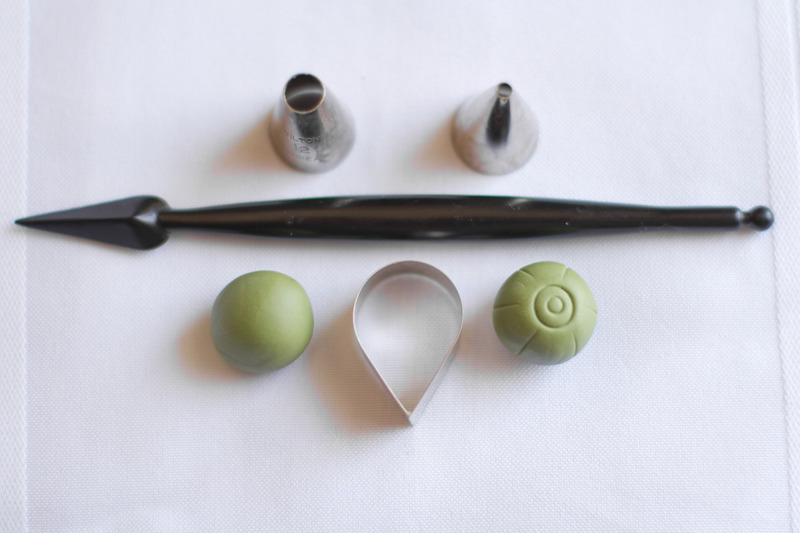 Roll moss green gumpaste centers into a ball about the size of your smallest rose cutter. 3. 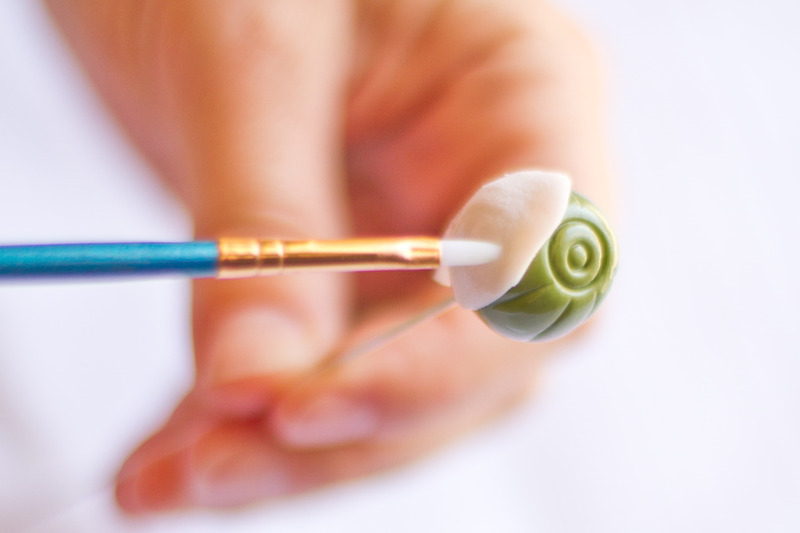 Use piping tips to make circular markings and the knife tool to make vertical markings all the way around. 4. 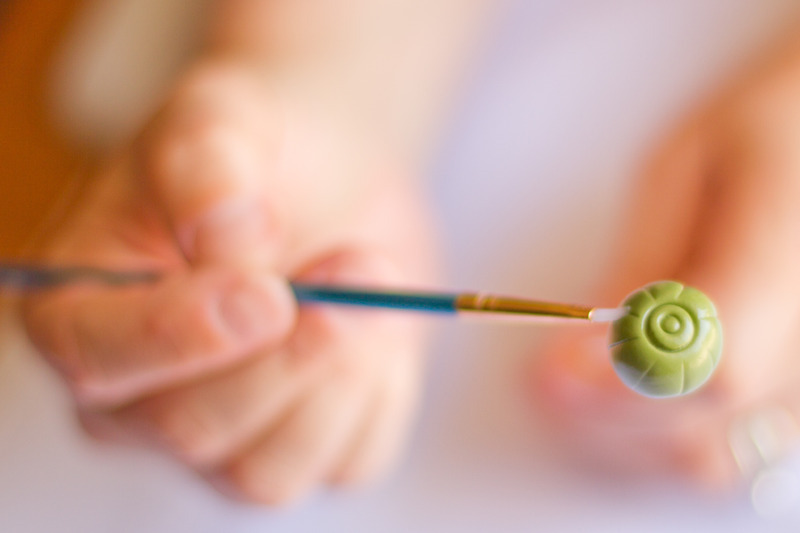 Dip the hook end of the wire in gum glue, insert in the center about halfway; let dry for a minimum of 24 hours. 5. Roll out desired color of gumpaste very thinly (almost transparent). Cut out 10-15 petals. 6. 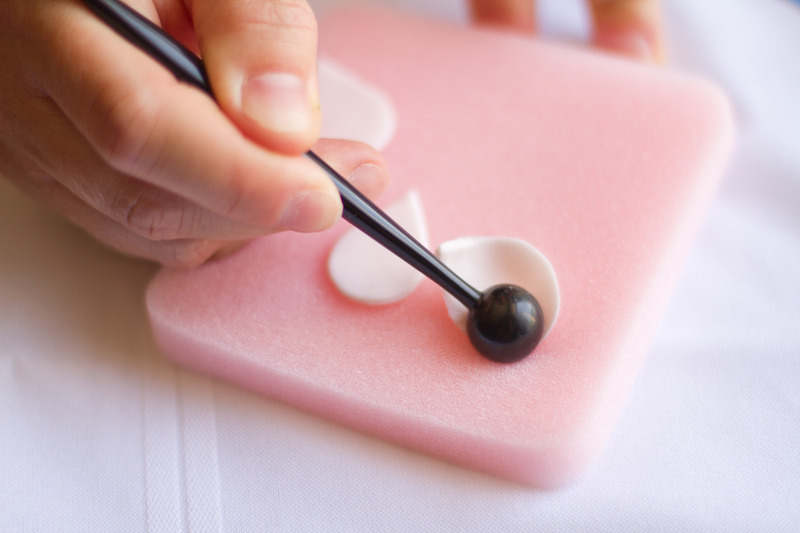 Working with 3 or 4 petals at a time, use the ball tool on the thick foam to thin the edges of the petal. 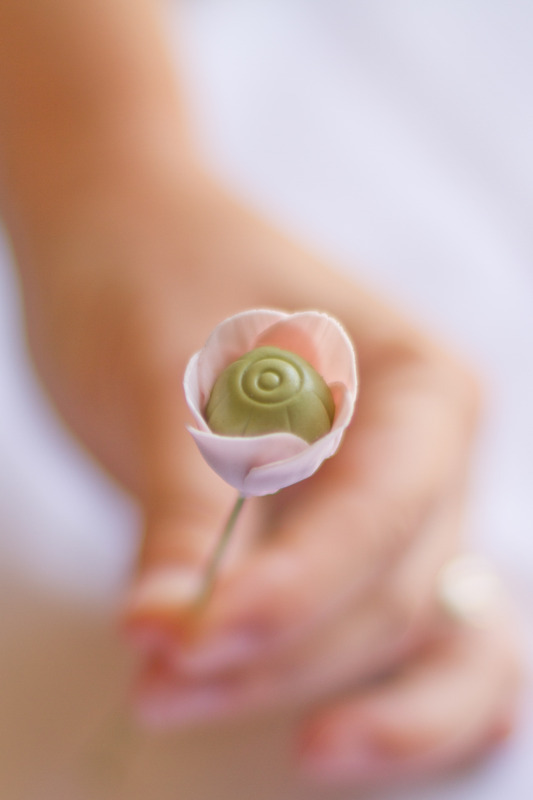 Cup the petal by pressing in the middle of the petal with the ball tool. Keep remaining petals covered so they don’t dry out. 7. For petals with more texture that work well for an open ranunculus, use your thin foam and roll the skewer over the petal. 8. To apply petals, paint gum glue on the flower center. The first row should have 5 overlapping petals. 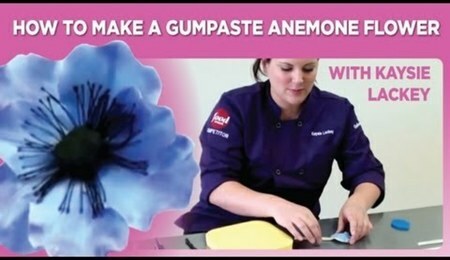 Apply gum glue after each petal to attach the next one. 9. Continue adding rows of petals and every 2-3 rows use a larger cutter for the petals. 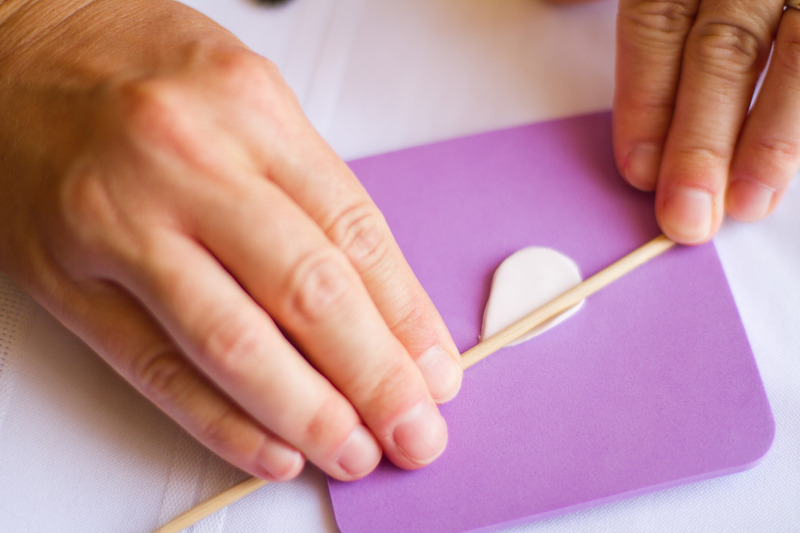 While the petals are still pliable, use the skewer to adjust the petals. 10. 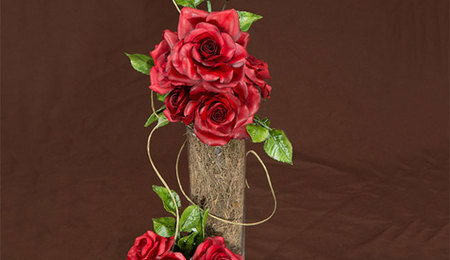 Allow the flowers to dry for at least 24 hours before putting them on the cake. 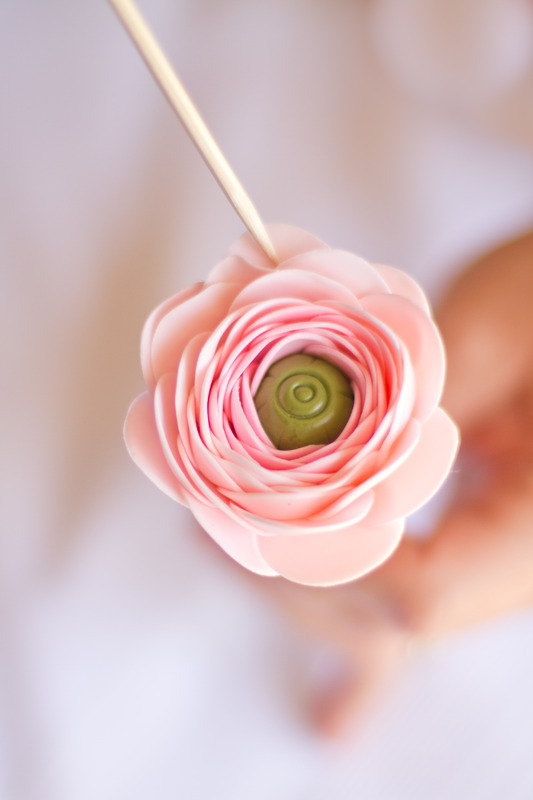 You can use the plastic flower former to help hold the petals up while it dries. Thank you. Love it, so pretty. Pretty! I have a similar tutorial on my blog. Thank you for sharing I have always wanted to attempt this flower. LOVED YOUR TUTORIAL !!!! THANKS FOR SHARING!! 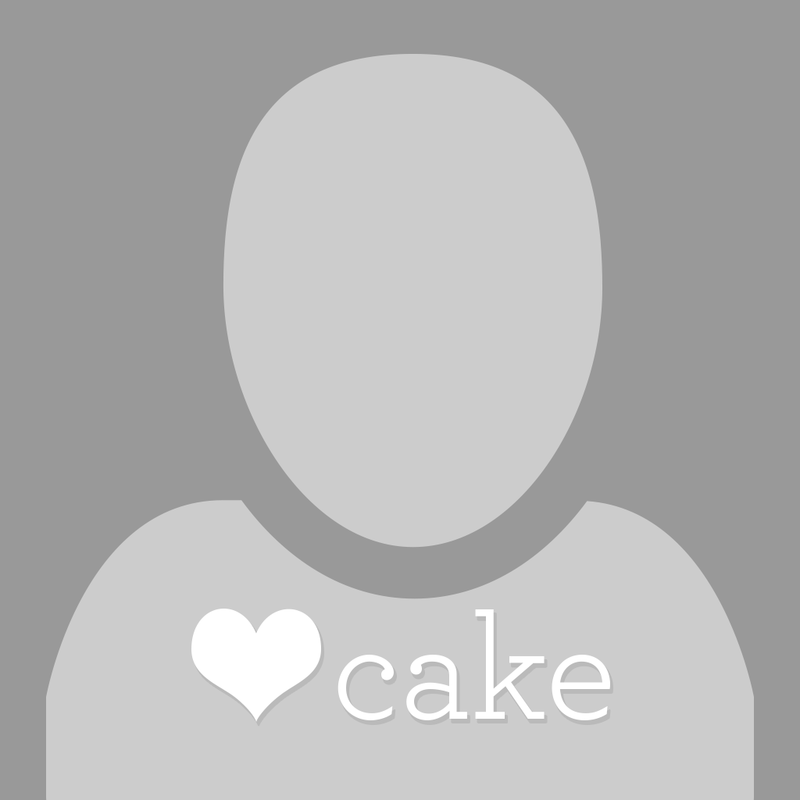 Hi Jac would love to see your blog, what is the link? Thanks everybody! It's my first tutorial so I'm happy if it helps anyone. Jaqs I would love to see your blog too! This is great, beautiful! Thank you for sharing. These are my favorite flowers.....great job, thanks for posting. Thank you so much for the tutorial, ranunculus are my favourite flowers. 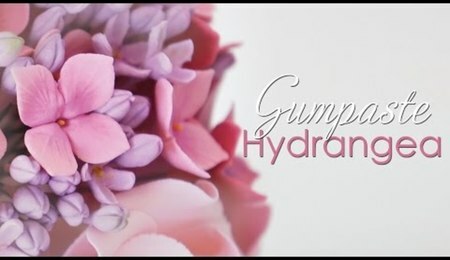 my favorite gumpaste recipe and the only one i use is nicholas lodge, it is great, it withstands the humidity, you just have to play with it, if it is real humid in your area you may need to add a little more water as you need: 4 large egg whites 2 lb bag of powdered sugar (sifted) 12 level teaspoons of tylose (cmc) 4 teaspoons of vegetable shortening beat the egg whites on high for a few seconds to break them up, reserve one cup of powdered sugar to knead in later after the gumpaste is finished. turn mixer on low and add the rest of the powered sugar, let this mix at medium speed for three minutes. Mixture will look like meringue(shiny and thick). at this point turn mixer on low and add the tylose and turn the mixer on high for a few seconds, your gumpaste will thicken, scrape your bown, mix again. 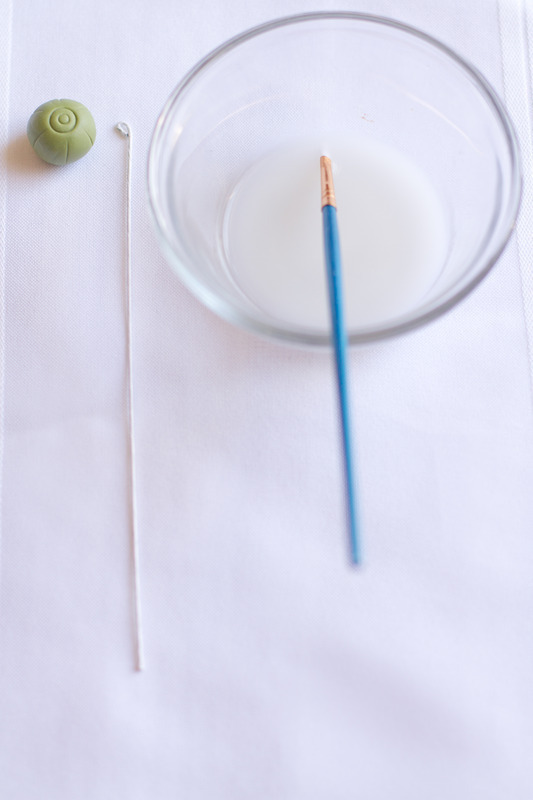 Turn the mixer out on a table sprinkled with some of the powder sugar, put the vegetable on your hands and began to knead it into the mixer, work fast, place the mixer into a tight sealed plastic bag and place in the fridge over night. take out of the fridge, let the gumpaste come to room temp before you use, (you cannot microwave this gumpaste to get it soft because of the egg whites) so make this inadvance of when you need it so it has time to come to room temp. You must knead the pieces you think you will use, add a little more vegetable shortening to your hands and knead this until it is pliable, if it is too crumbly to knead add a few drops of water and knead. this gumpaste can be frozen. good luck!!! !